Low-viscosity epoxy curing agent provides sufficient working time and expedites cure time in cooler conditions. Combine with resin to create a rigid, high-strength moisture-resistant solid with excellent bonding and coating properties. For use with Totalboat and other 5:1 epoxy resins. Sizes: Size A 6 fl. oz., Size B 25 fl. oz., and Size C 127 fl. oz. 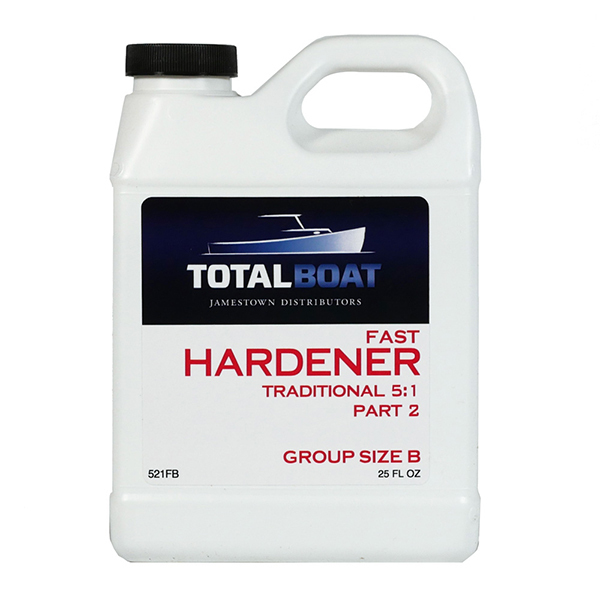 TotalBoat 5:1 Fast Hardener is ideal if you’re in a hurry and want to get things done a little faster, especially in cooler temperatures, which lengthen the cure time of epoxy resins. It’s easy to measure the right mix, especially with the pre-calibrated 5:1 Epoxy Pumps (sold separately). Combine Fast Hardener with 5:1 Epoxy Resin in a five-part resin to one-part hardener ratio. Then spend about two minutes mixing thoroughly so all those resin and hardener molecules combine like they’re supposed to. The epoxy resin/hardener mixture can be used for wetting out fiberglass and other fabrics, coating, and bonding. The cured result is super strong and moisture resistant. Note: Our 5:1 Epoxy Pumps are intended for use only with TotalBoat epoxy containers, and they don’t fit other traditional marine 5:1 epoxy containers. If using another brand of 5:1 marine resins with TotalBoat 5:1 hardeners, or TotalBoat 5:1 epoxy resin with other traditional 5:1 hardeners, measure the resin and hardener components by volume OR use only one brand of containers with their matched pumps.